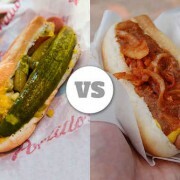 Chicago vs. New York Hot Dogs: Who’s Got the Winningest Wiener? I just found this article on the Huffington Post. Great article about the Battle Royal of the two giants. I’m not talking Whitesox or the Mets, the Yankees or the Cubbies. I’m talking about what really matters. THE HOTDOG!